Ok, enough of a break already! It’s time to get those pliers and wire cutters back out and to MAKE SOMETHING!! We can start out easy if you want, sort of ease ourselves back into the groove. The important thing is simply to make something…anything. 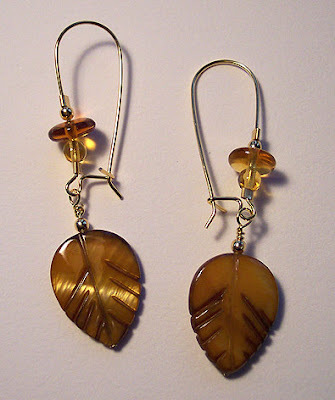 How about a really simple pair of earrings? All you need are two matching focal beads and a few smaller accent beads, a couple of crimps, two headpins, and some ear wires. How easy is that? I really like the large kidney wires like these, because you can add a few extra beads for some panache, but feel free to skip that part if you don’t have that style of wires handy. 1. Slip a pretty focal bead and a smaller round metal bead onto a headpin. Create a wrapped loop. See? You’re already half done! 2. Slip a crimp bead, a few accent beads, and another crimp bead onto the kidney wire. You might have to straighten out the bend in the end of the wire to do this. Just rebend it gently when you’re finished. 3. Flatten the crimps to hold the other beads in place. Slip the wrapped loop into the ear wire loop and tighten it slightly with your pliers. That’s it. You’re done.